Bagels by the Park's iron gate repair revealed the old Park Lane Florist sign from over 20 years ago, an old Carroll Gardens fixture at Smith & President Streets. 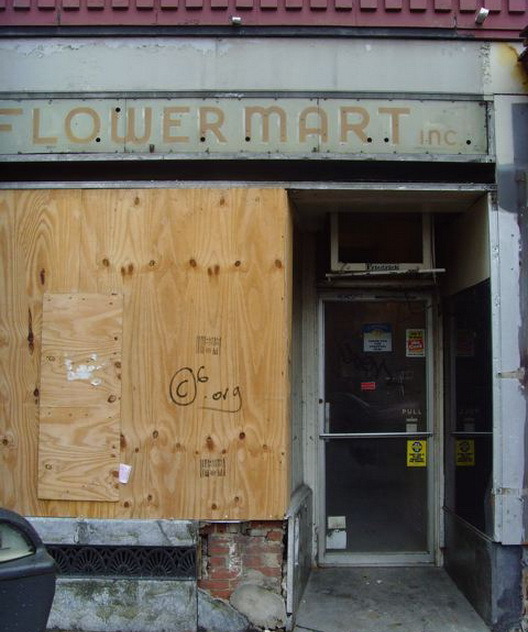 Another florist sign blooms on Henry Street in Brooklyn Heights after a façade strip and board job reveals the quaint Flower Mart sign. We're sure that, like all old signs, except the ones that might be sold for decorative purposes, these will be covered up again soon. I remember the owners of Park Lane Florist and shopped there often. The wife's name was Mary, and she eventually went blind (I think she was a diabetic). They were very nice people. Show us the signs on Clinton! I have pics of Clinton Cafe sign. I'll send them. PS: Too bad that the beautiful hardware sign that was briefly revealed on Atlantic (Moxie playspace to come) is now gone. 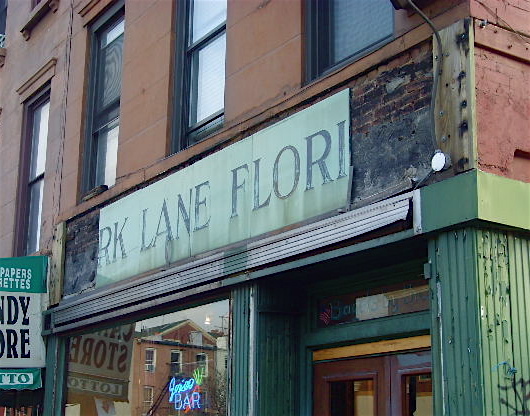 Actually, the Park Lane Florist sign has been visible ever since Bagels by the Park opened years ago. They never covered it up, just hung an awning over it. Yes, the sign, it was partialy visable, but, now you can see more of it. BBtheP was JV Bagel, which I loved! I'm not too fond of the newer store. Never go inside..I have very vague memories of the Florist shop, and I have been in CG since '88. I can't remember what it was after the florist...Great, Email the pics to Gowanus Lounge!! Happy Friday.